If you want a small, well-featured camera that allows you to easily take manual control over its exposure settings, the PowerShot G12 is a good choice -- it also does HD video. However, its picture quality isn't perfect: it's grainy and there is noticeable barrel roll from the lens. Overall, though, it can capture well-defined and naturally coloured images. It's convenient for anyone -- especially travellers -- who wants an easy-to-carry camera with plenty of features. The Canon PowerShot G12 is an advanced compact digital camera that can fit in your pocket, yet provides a full gamut of manual controls and a relatively big zoom. It's the type of camera you should consider if you want something that will give you full creative control and a flexible shooting range but without the bulk of a digital SLR and without the expense of an interchangeable lens camera. Indeed, the G12 costs $799 and you don't have to change lenses to suit your shooting situation — it comes with a reasonably versatile 28-140mm zoom lens. However, the G12 does have some flaws; its image quality is a little too grainy for our liking, and its zoom lens exhibits plenty of barrel roll at wide angles. It could also use a better shutter button and more solid-feeling control buttons. The PowerShot G12 replaces last year's PowerShot G11, which replaced the G10. The G11 had some notable differences with the PowerShot G10 (most prominently a 10-megapixel sensor on the G11 versus the 14-megapixel sensor on the G10), but the PowerShot G12 doesn't offer any significant advantages over the G11. It's very much an incremental upgrade that includes some fine-tuned adjustments to the overall offering. In particular, the G12 can shoot in high-definition mode (1280x720 versus the G11's 640x480 video mode) and record stereo sound. The G12 has focus tracking, and it also offers a teensy bit more shooting speed compared to the G11 (up to 2 frames per second versus 1.3fps). The other main difference between the G12 and the G11 is that the G12 offers an expanded set of sensitivity settings: you can now select ISO levels such as 125, 160, 250, 320, 500, 640, 1000, 1250, 2000 and 2500. A sample video shot at a Sydney Kings basketball game. If you already own the G11, then apart from the features we've just rattled off the PowerShot G12 won't offer anything that you haven't seen before. It has the same 10-megapixel, 1/1.7in CCD sensor, the same f/2.8, 28-140mm zoom lens and the physical features of the cameras are practically identical. There are dedicated dials for changing the exposure compensation, shutter speed, aperture value and ISO speed, and there are also buttons for changing quickly to macro mode, switching to manual focus and selecting a custom focus point. Another handy feature is the auto-exposure button, which, when pressed, changes to the optimal exposure settings regardless of the shooting mode you are in. It can be very useful if you're shooting in changing lighting conditions and haven't yet figured out the correct exposure settings manually. A 2.8in, hinged LCD screen can be used to frame your photos, and there is also an optical viewfinder that can be used as a fallback if the conditions are too bright and you just want to get your bearings. However, the optical viewfinder doesn't reflect what is seen by the lens, nor does it show you the correct focus, so it doesn't give you an accurate representation of the frame you are about to capture. Basically, you'll always need to use the LCD screen. The G12's body feels sturdy overall, but we hate its shutter button, which is too squishy and doesn't have a distinct two-step feel to it. The buttons on the rear also have a slightly cheap feel to them, but they are easy to press for the most part. We think the front dial for the aperture is a little too stiff; we'd prefer it to be looser, as moving the aperture one step up or down can be a little difficult. The G12's picture quality is great overall. It can capture accurate colours and reasonably clear images, but it does suffer from noise, which becomes especially noticeable when you closely crop your photos. The bright f/2.8 lens means you can shoot with a relatively slow ISO speed in low-light conditions, which should help keep the noise down. 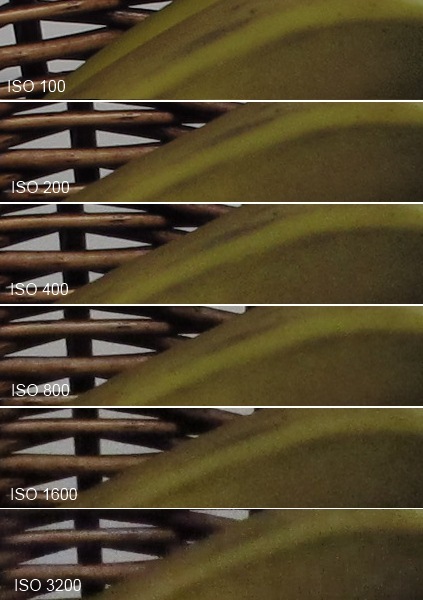 If you choose any setting above ISO 400, then noise and pixel discolouration will become more noticeable. From ISO 800 and above, blacks will have purple speckles and images will look muddy overall, even when you don't scrutinise them closely. The lens doesn't exhibit any noticeable chromatic aberration, but due to its wide angle it can make straight objects look skewed. If you're shooting objects around the home or at work, they will probably end up looking taller than they really are; if you're shooting buildings, they will look like they are leaning or, in some cases, slightly concave. The depth of field of the lens is good when you're shooting in macro mode and using the zoom to really hone in on your subject will beautifully blur the background of the image so that you can't recognise it; at wide angles, backgrounds won't be rendered with the same level of blur. 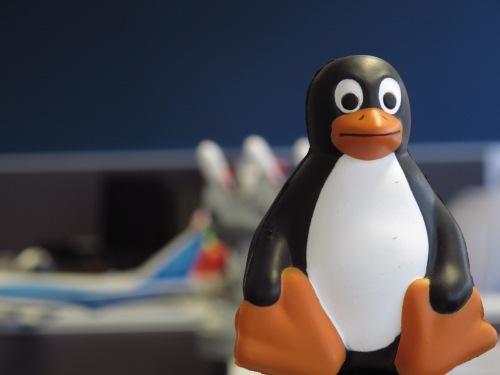 The top image shows a zoomed out macro shot of Tux, while the bottom image shows a zoomed in macro image. The background blur of the bottom shot is much nicer. The PowerShot G12 sports scene modes and custom colour modes, and it also includes an HDR mode. It's a very good camera overall, but its picture quality is not up to the standard of an interchangeable lens camera, nor a digital SLR (such as the great Canon EOS 60D). Its video quality also isn't great, but it's an improvement over the G11. 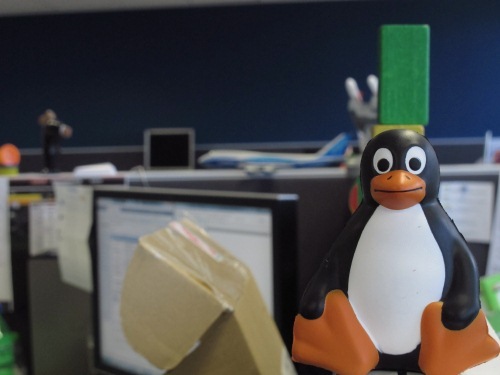 However, its compact size, convenience and manual features make the PowerShot G12 an interesting proposition. Enthusiasts who are sick of changing lenses but still want a quick way to change exposure settings should consider it, as should travellers, due to its relatively small size and vast range of capabilities. Alternatively, the Canon PowerShot S95 can be considered if you want a small camera with manual features — it has the same sensor as the PowerShot G12, but a slightly different lens (f/2.0, 28-105mm).